Twitter use is exploding in the UK and, with celebrities there starting to hat-tip the microblogging service, many are predicting it is poised to tip over into mainstream use, much as Facebook did a couple of years ago. 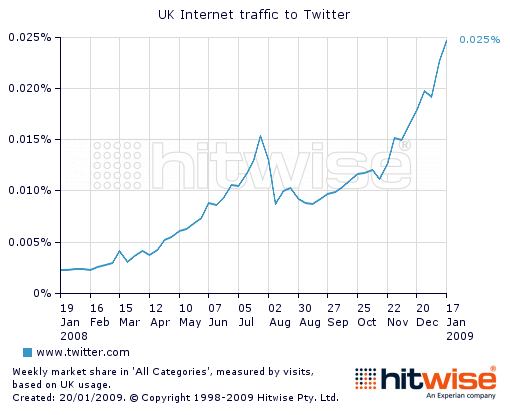 UK Internet traffic to Twitter has increased 10-fold over past last 12 months, according to research house Hitwise. For the week ending January 17 2009 Twitter ranked as the 291st most visited site in the UK, up from a ranking of 2,953 for the week ending January 19 2008. UK Internet traffic to the site has increased by a staggering 974% over this period, but that does not even count traffic via third party applications like Tweetdeck or the mobile web. Time spent on the site has trebled and Twitter’s penetration per head is now even deeper in the UK than in the US. It ranked as the 291st most visited website in the UK, while in the USA it ranked 350th. It is also becoming a big hub for sending traffic to other sites. Meanwhile, Facebook remains Britain’s most popular social network and is now the second most visited website in the UK after Google UK.